There were a lot of provocative projects to experience and discuss – on the connection between everyday practices, new technologies, global warming and the financial crisis. You would think these issues will definitely make you feel depressed, but in fact exploring ways to react to (rather than ignore) these challenges, felt quite empowering. There were some experts on the field, but as well artists, who understand themselves as researchers reducing the barriers between thinking and making. When I decided to visit the Transmediale I thought it would be a good idea to not take the plane all the way. Shaken and tired from a night long bus trip I arrived in Berlin. To get around this gigantic city I bought an old, sky blue children bike. It was enormous fun to ride by the “Brandenburger Tor” heroically on my tiny cycle. When I finally found the Transmediale building among the gigantic new constructions in Berlin Mitte, I was impressed by the quality and content of almost all performances and lectures on the program. The exhibition was excellent, in particular a piece by Marina Zurkow, the animation “Poster Children”. Marina was one of my favorite teachers at ITP. In her work she uses several forms of narratives in animated videos to create dynamic layers of storytelling. Next I was amused by Michiko Nitta’s morbid project Extreme Green Guerrilllas, a group of people who take green living to an extreme. They are ironically and playfully suggesting to eat merely pigeons and rats and solve overpopulation and resource problems through premature death, administered via an euthanasing earring. The “Arduino guys” were at the Transmediale as well of course. E.g. 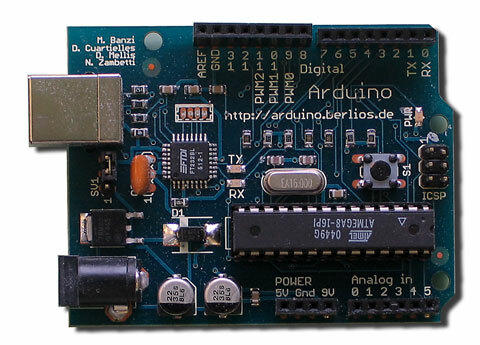 co-founder of the Arduino project, Massimo Banzi. He talked about open-source electronics during the fantastic fair trade hardware panel, (you can watch all lectures online). Another of my most favorite projects was a split-screen video installation called Six Apartements by the Berlin based US-American artist Reynold Reynolds. The viewer observes people in different ages inside their apartments. Isolated and unaware of each other, each character in the film is listening to a TV set or radio channel in the background, exposing themselves to “information” on wars, catastrophes and facts on global warming. None of them takes any action in response to the things they hear about. It rather seems as if listening to the media gives them comfort in their quiet, empty rooms. This video installation won the second prize. In the afternoon I met some amazing ladies of the faces mailing list, a group of female media artists and curators, keeping each other posted on events and exhibitions on gender, technology and art. Every now and then they meet in real life, drink coffee and do some networking. During the lectures in the evening I felt a little desperate. The talks were focusing on global disasters awaiting us if we don’t change our consumer behaviors. I learned about encouraging, economically sustainable alternatives as well though, restoring my hope for change. For example the open hardware or fair trade hardware movement. What is it about? We have to realize that the production of most of our new technology (like the one we buy from brands such as SONY or Nokia ) is not only directly connected to extreme environmental damage. It is also actively supporting conflicts in African countries through illegal exchange of mineral resources against weapons produced in the West. The trade of “tantal”, an essential crystal for all mobile phones, has financed a cruel war in Congo that resulted in more than 3.6 million deaths to date. The project tantalum memorial deals with this issue and deservedly won the first price of the transmediale Award 2009.